I called my sister around 4pm on May 10th, day ten of my Ice Age Trail FKT attempt. I will never forget that day. Not only was it the day that I decided to stop my journey, but it was also the day my sister reminded me of exactly why I was doing what I was doing. And that hit home hard. I was fighting my body and my body was fighting me – to go on would be a complete paradox. My purpose was to prove that anyone can do anything through hard work, determination, and the respect of their body…and yet, here I was falling apart from the inside out. Brian and I left for St. Croix Falls on April 30th, the day before starting my ambitious journey. It was a long 6 hour drive with a very loaded car full of shoes, clothes, food, and supplies – basically our entire house packed into a Toyota Matrix. There really was nowhere to eat so we ended up picking up a few things from the grocery store. 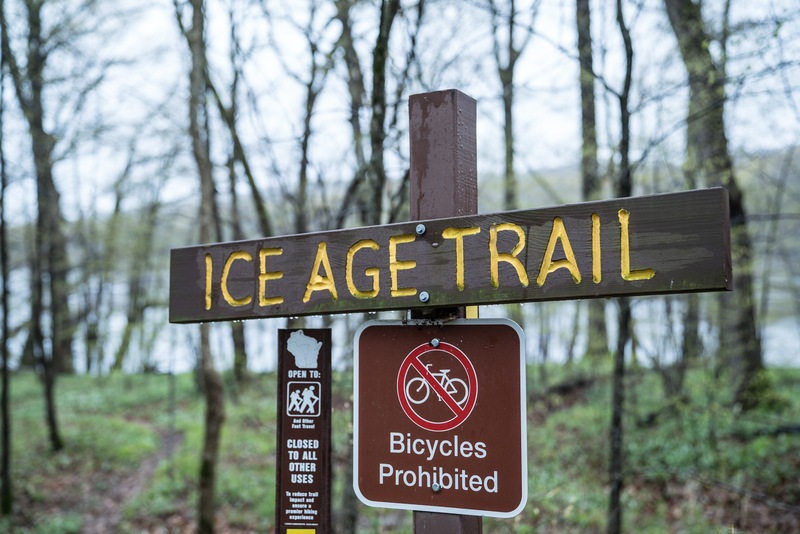 It was a dreary day up north, but we did go to the Western Terminus rock – the start of the Ice Age Trail. It overlooked the beautiful Mississippi River which was swiftly moving, crashing into large boulders of earth. The trees were bare still so only shades of brown surrounded us as we explored this sacred area known as “the start line.” It was an incredible site. We went back to the hotel which was 5 minutes away, ate dinner, and packed up for what would be such a shorter journey than expected. Less than 12 hours to go. My alarm sounded on May 1st at 430am. I knew I wanted to start by 5am but because the rock is located in a start park area, we could not enter until 6am. I’ll be honest, that threw me for a loop on day one – I was really hoping to get moving. The earlier the better. We headed to the trail and with us was Carrie, owner of Dream Lens Media, and her husband Tim. They are wonderful people and I was so happy they were able to share in this experience with me taking pictures and video footage along the way. Of course, the first day was not nearly as ideal as I would have liked. It was raining, or sleeting, or snowing at any point of the day. Perfect. In the grand scheme of things though, the weather was actually quite nice – it was cool and crisp along the trail and when you can’t feel a limb, there really is no pain to feel! I made it 60 miles that day…it took me longer than I had hoped but given the weather and need for more clothing changes, I was okay with it. I can’t tell you what segments I completed that day, nor any other segment for the remainder of my journey. My job was to run, no matter where or what I was running. 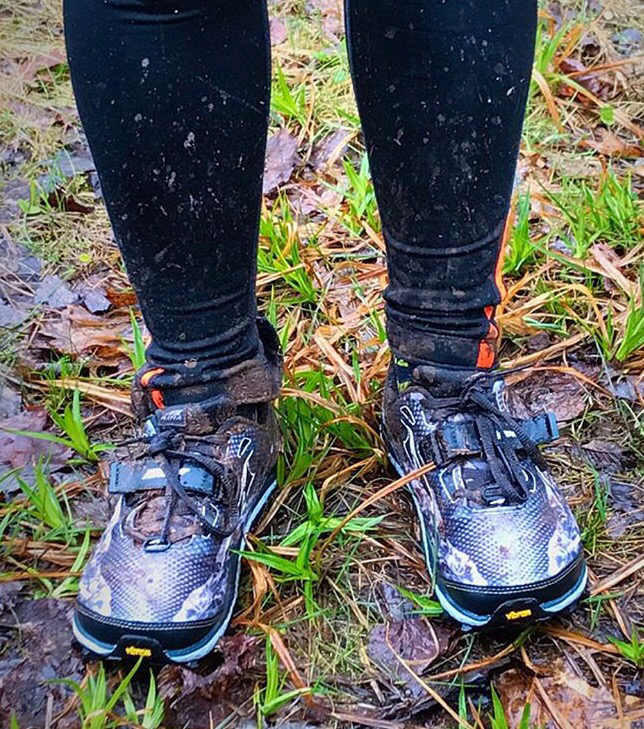 I had good trail conditions on day 1 with road/gravel sections and maybe only ~3 miles of standing water throughout. I didn’t know just how bad it was going to get. It was the end of the day May 2nd and Brian congratulated me for another 60 miles in the books. The day was different than the first day. We were more organized and prepared. Early morning, around 9am, one of the IAT volunteers met us at one of the connecting road sections. He was surprised to hear just how much standing water there was, but really didn’t think it would be a problem in the upcoming days. That was reassuring on many levels. I continued on that connecting road segment and back into the woods. About 8 miles passed when I was met by Brian and another volunteer who gracious gave us water and ClifBars. He had wonderful things to report about the upcoming segments and also made us aware of one of the more confusing areas within the next section. That was super helpful – there is so much logging in the area and fallen trees from past tornados, at times it was really tough to find blazes. This was nothing like running in the central and eastern terminus. I ran past the Boy Scout camp and that was my signal the section was coming to an end. I was now starting a long gravel/grassy train tracks section. Yes! I was getting off the trails out of the water and onto stable ground – perfect. I did a lot of talking to myself in that section – I also hallucinated often…I think it’s the straightaway that really does that to me. So I tell myself. With 1 mile to go, and Brian at my side for it, I see up ahead an older gentleman taking photos. It was another IAT volunteer – he was so excited and couldn’t wait to hear about my journey so far. I stopped on the tracks near a bison farm and we hiked together to the area where the car was. He was so curious about the trails and so hopeful. It was a breath of fresh air to be honest. Such a kind person – all of the volunteers were that came out. But unfortunately I couldn’t stop to talk for long, I carried on running once again. In one of my last trail segments for the day, Brian met me halfway coming from the ending location. It was really awesome that he would do this…drive the crew vehicle to the next stopping point and run or hike in to meet me – amazing. It gave me something to look forward to everyday. 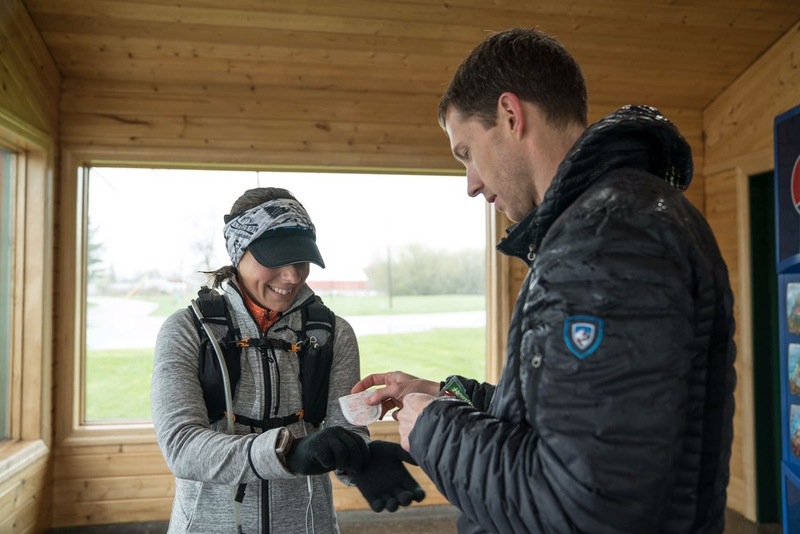 On one of those final segments, he jokingly tells me something he was told not to share with me by one of the volunteers…”you just went through the highest concentrated bear area in WI.” It was a long day, wet, and trail conditions were worsening. And now bears were on my mind. Oh and beavers. My first encounter was on day 2. I thought it would only be 1 or 2 encounters really, but no, I had to cross beaver dams nearly every day I was out there. It was pretty neat actually. I would come up to a dam – basically a pile of sticks and branches at the edge of a lake or pond, and really everything in between, in a row connecting one side of the trail to the other. I had to balance on beaver homes without falling to one side. At times this was a piece of cake, but there were a few times I questioned my life – I kept picturing alligators if I’m going to be honest. If I fell in, there would only be alligators and I was done for. The girl eaten alive crossing a beaver dam. (As it turns out, there are no alligators in WI – only at the zoo). I also pictured what it would be like if I fell through a beaver dam. I often giggled to myself because this was a conversation my brother and I had before I left. He equated falling through to be like a cartoon – the beaver family eating dinner and I fall in from the roof top perfectly into a chair. We are nerds, but it kept my mind occupied. For all 10 days, I probably crossed a dozen or two beaver dams and although I almost lost my balance, they were pretty safe parts of the trail. Every day around lunch time I would get a call from Rivers. I looked forward to it because I knew it was my chance to complain, vent, cry, and everything in between. By day 3 though, I was still only crying to myself in the woods. Rivers and I would discuss everything but really it came down to ‘how are you feeling?’ He is one of those guys that is a saint. He would listen to me talk about anything on my mind and then talk to Brian about more that was on my mind. He coached me through aches and pains, body adaptation, my mental state, and my cycling emotions. When Rivers called, I knew it was not only lunch time, but time for a mental break from my journey. I turned it off for those 15-30 minutes. It was a release. And on day 3 I needed that. I started out day 3 in the Blue Hills. There is a north and south segment – both beautiful trails but destroyed by tornados 2 years ago. With limited resources, the trails were not well maintained and the fallen blazed trees, overgrowth, and my own mind got me. Got me really bad. I was in mile 2 for the day on May 3rd and instead of going left, I went straight. I was given information about the next 70 or so miles by very helpful runners of the trails in the north woods. I think with my deteriorating mental state, I started to get the information mixed up in my head. I was convinced there was a large river crossing in this first 8 mile stretch. I came to a junction where there were yellow blazes, pink, white, and blue ribbons, and red X’s on trees – I had been following all of that since starting, so why would it change? Going straight through the 10 foot river crossing (and now I know which river he actually meant…the Wisconsin River) and up a somewhat trail looking hill…I was convinced this was it. I had to go straight. I had so many fallen trees already to climb, why would this be different? I was following red X’s and blazes and everything in between – why would that change? I was completely lost. I had a GPS set for the trail and still, I could not figure out how to get back to the IAT. I radioed Brian – no answer. I was frantic – a total crazy person at this point. It took me 2 hours to complete the first 5 mile stretch. I was mentally wrecked. I really was not accepting of “how slow” I was going and this was the first time since starting I was embarrassed about my progress. I didn’t want the world to know I was struggling or that I screwed up. That mentality dictated the rest of the day for me…I had my first day of amplified pain, rolling tears, and hiking. So much self-doubt with every step. Onward to the second Blue Hills segment, an 8 mile stretch. At this point, after getting lost and having really poor trail conditions, I was nervous about entering the next segment. This became one of my weaknesses as my journey continued – with growing fears around wildlife, increased standing water, and more hallucinations than you can imagine, I was secretly scared to start each section. I can’t even begin to describe how I felt the moment I saw Brian whether he was meeting me halfway or waiting at the end. The mind is so powerful and even early on, I was on overdrive – too many thoughts and mind games. It was only day 3.